Although the lecture videos and lecture notes from Andrew Ng‘s Coursera MOOC are sufficient for the online version of the course, if you’re interested in more mathematical stuff or want to be challenged further, you can go through the following notes and problem sets from CS 229, a 10-week course that he teaches at Stanford (which also happens to be the most enrolled course on campus). It’s not hard to end up with a 100% score on his MOOC which is obviously a (much) watered down version of the course he teaches at Stanford, at least in terms of difficulty. If you don’t believe me, just have a go at the problem sets from the links below. Lecture notes 7a (ps) (pdf) Unsupervised Learning, k-means clustering. MIT’s Fall 2015 iteration of 6.00.2x starts today. After an enriching learning experience with 6.00.1x, I have great expectations from this course. 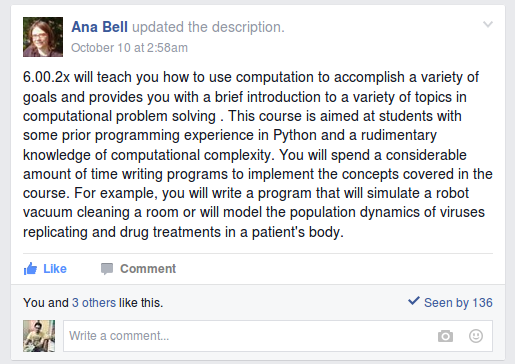 As the course website mildly puts it, 6.00.2x is an introduction to using computation to understand real-world phenomena. MIT OpenCourseware (OCW) mirroring the material covered in 6.00.1x and 6.00.2x can be found here. The course follows this book by John Guttag (who happens to be one of the instructors for this course). However, purchasing the book isn’t a necessity for this course. The syllabus and schedule for this course is shown below. The course is spread out over 2 months which includes 7 weeks of lectures. The prerequisites for this course are pretty much covered in this set of tutorial videos that have been created by one of the TAs for 6.00.1x. If you’ve not taken 6.00.1x in the past, you can go through these videos (running time < 1hr) to judge whether or not to go ahead with 6.00.2x. Teach Yourself Machine Learning the Hard Way! little / no knowledge of algorithms. studied engineering math, but it was rusty. no knowledge of modern optimization. zero knowledge of statistical inference. I think, most of it is true for many engineering graduates (especially, in India !). Unless, you studied mathematics and computing for undergrad. Lucky for me, I had a great mentor and lot of online materials on these topics. This post will list many such materials I found useful, while I was learning it the hard way ! All the courses that I’m listing below have homework assignments. Make sure you work through each one of them. I have been searching for good MOOCs to get me started with R and Python programming languages. I’ve already begun the Johns Hopkins University Data Science Specialization on Coursera. It consists of 9 courses (including Data Scientist’s Toolbox, R programming, Getting and Cleaning Data, Exploratory Data Analysis, Reproducible Research, Statistical Inference, Regression Models, Practical Machine Learning and Developing Data Products), ending with a 7-week Capstone Project that I’m MOST excited about. I want to get there fast. I won’t be paying for any of the remaining courses though, but still will get a certificate of accomplishment for each course I pass. I have alredy begun with Getting and Cleaning Data and Data Scientist’s Toolbox. 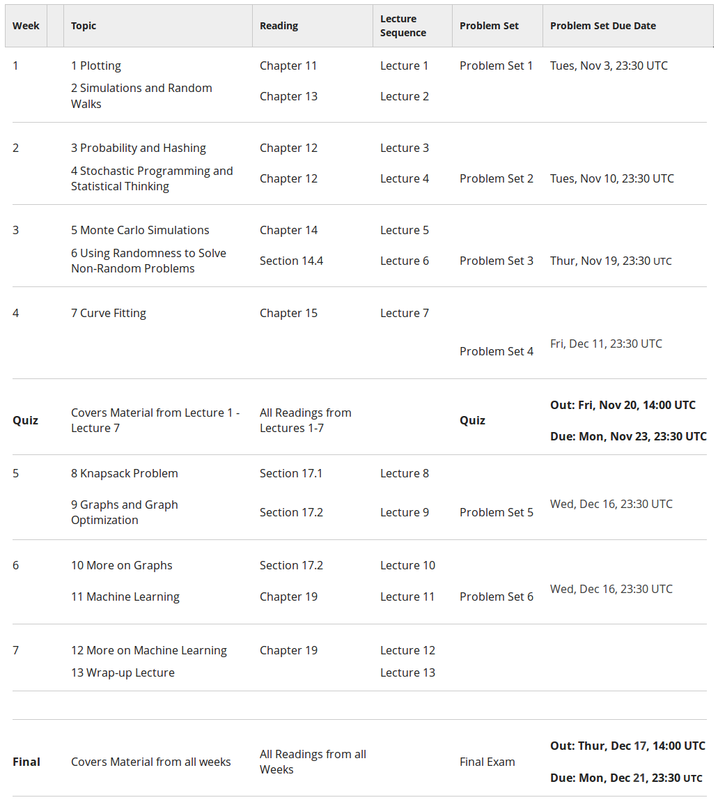 I checked today, and it seems Andrew Ng’s Machine Learning course has gone open to all and is self-paced. A lot of people have gone on to participate in Kaggle competitions with what they learnt in his course, so I’d like to experience it — even though it’s taught with Octave / MATLAB. My very short term goal is to start participating in these competitions ASAP. I will be learning the basics of Git this week and along with that, about reading from MySQL, HDF5, the web and APIs. I intend to start reading Trevor Hastie’s highly recommended book, Introduction to Statistical Learning. Meanwhile, I need to get started with Git and GitHub too, and I found a very useful blog by Kevin Markham and his short concise videos are great introductory material. The only reason I have reservations against Andrew Ng’s course is that its instruction isn’t in R or Python. Also, CTO and co-founder of Kaggle, Ben Hamner mentions here how useful R and Python are vis-à-vis Matlab / Octave.